--14 weeks of rehearsal for the cast. --12 months involvement for me. --Local concerns over the "appropriateness" of the show dissolved in light of 4 weeks of solid sell outs, standing ovations, 2 extra performances which also sold out. --While long time die-hard (tie-dyed?) 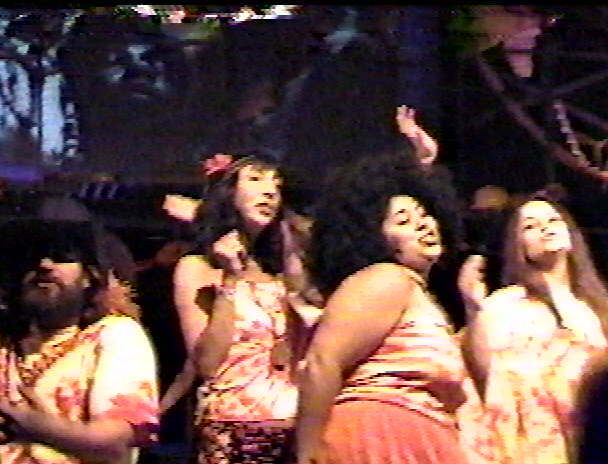 HAiR fans and alumane may be impossible to completely satisfy when presented with a new version of "their" show, the majority of people who saw HAiR reacted with gratitude, tears, joy, even amazement that a community theatre could put on such a huge complex production with such degree of professionalism. --The Willamette Tribe took up the challenge and I admired their inventiveness, tenancity, and consistently high dedication and energy. The technical contributions were many and made by a team with great creativity---they provided a dazzling backdrop of sound, lights, images, props, and scenery so the on-stage Tribe, the cast, could shine their most. --I have never spent time on a production which gave me such gratifying results. HAiR transcended the literal confines of a theatre, and the prosaic situation of "doing a show." The dream I had of giving an audience a HAiR to remember was fulfilled with high flying tie-dyed colors.